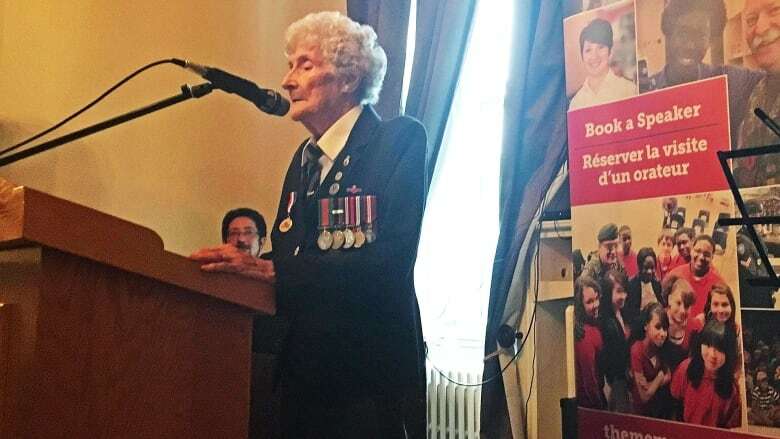 A 93-year-old veteran of the Second World War was joined by Canadian media personalities in a rendition of The White Cliffs of Dover during a fundraising dinner for The Nichola Goddard Fund — raising $2,000 on the spot. Veteran Joyce Paynter said she has memories of being asked to sing during the Second World War. "When the bombs were dropping and people were in air raid shelters, they said sing," Paynter said. 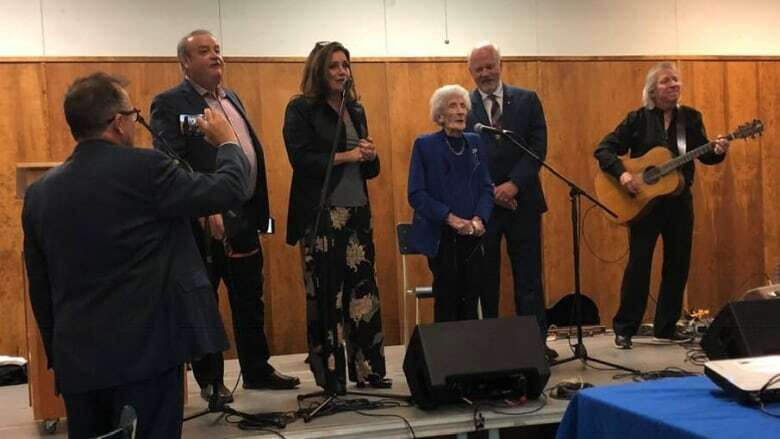 The 93-year-old hadn't thought about singing until a fundraising dinner for The Nichola Goddard Fund on Saturday night in Cornwall, P.E.I., when MLA Kathleen Casey — serving as master of ceremonies — asked her to. "I said about the only thing that I really remember was Vera Lynn singing the war songs — We'll Meet Again and The White Cliffs of Dover," Paynter said. They settled on The White Cliffs of Dover and a spur of the moment fundraiser began. It was the tenth and final fundraising dinner for the Nichola Goddard Fund, which included guest speaker Peter Mansbridge. Well-known media personalities Lisa LaFlamme and Jeff Hutcheson were also there. During a break in the meal, Casey asked the crowd to donate money to get Paynter onto the stage for a song. Then she asked for more donations to help get the others to join her on stage. "So every time somebody went up they offered more money. So I think the grand total for the choir was about $2,000," said Sally Goddard, mother of Capt. 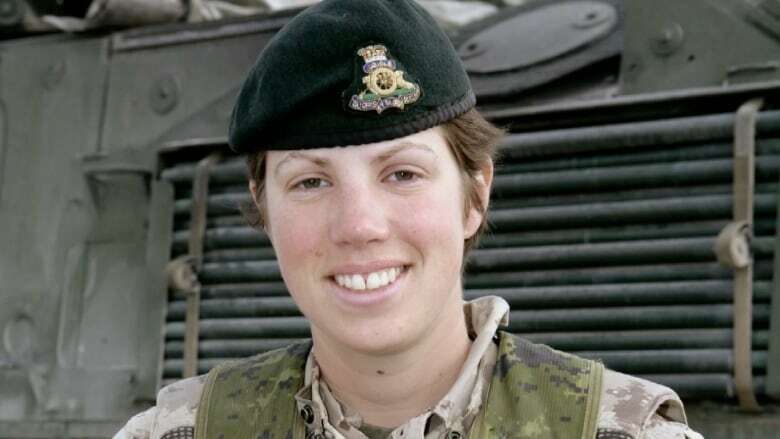 Nichola Goddard who was the first female Canadian combat soldier killed in Afghanistan. "I think it was a shock for everyone. I think it just shows the goodwill that was in the room," Goddard said. Goddard was pleased that the impromptu moment at the fundraising dinner could showcase the female veteran. "She entered into everything as I am sure she has throughout her life — with a great deal of spirit and graciousness," Goddard said. "It was fabulous, she was a lovely woman and obviously well loved and well respected by the community that was in the room, she got about three standing ovations which she deserved so it was terrific." It was a memorable experience for Paynter who has been attending the fundraising dinners as much as possible, to be a part of raising money to help other veterans and their families. She even says she could be coaxed to sing again at another event — if the price is right. "I would try, yes, certainly if it was to raise money, you know," Paynter said. 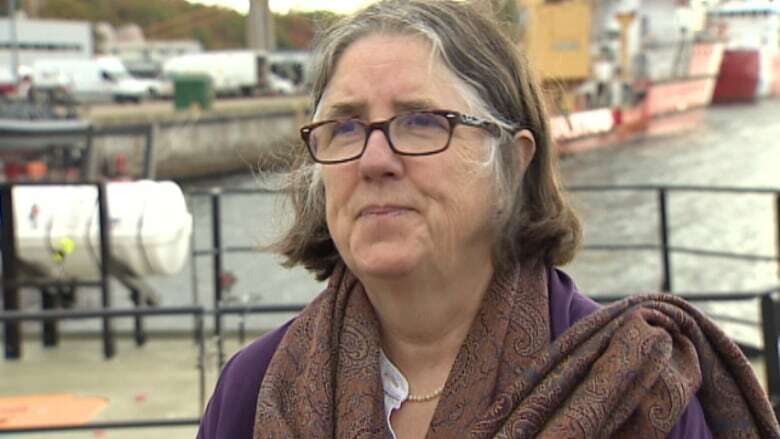 "Nichola was very proud of what her grandparents did in the war and I think by the same token it would just be extended to Joyce," Goddard said. "She is a wonderful woman and it was great to have her there and I think that Nichola would have been tickled pink." Goddard said The Nichola Goddard Fund is now to be administered by the True Patriot Love Foundation, a national veteran's charity. She said they are still waiting to hear what the dinner's fundraising total was.